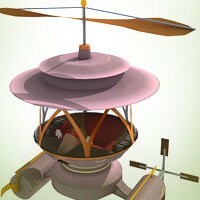 A device called the “Uricopter" plays a critical role in the story of RIA - The Lightclan Chronicles. This flying machine is outfitted with all the creature comforts its creators could imagine they would need for flights to uncharted territory. On-board stores and equipment included preserved foods, wines, maps and a small library complete with reference works and literature. This paper model is also commissioned by Stenarts and now we share it to you all. I also made parts for its interior cockpit or cabin. This guy who is riding a pumpkin trike is a Morcs, once a thriving clan that specialized in hunting and farming, the number of Morcs has been heavily decimated by Noctus’ forces. The remaining Morcs serve as guards of the great refuge and scouts for the resistance. They are mainly characterized by their practical and down-to-earth attitude. The story is from a graphical novel project RIA - The Lightclan Chronicles created by Thorsten Kiecker. This paper craft is a commissioned project from STENARTS more than a year ago for a comic exhibition in Germany, now we make this paper craft template available for free. There is another model and it will be release for free too. 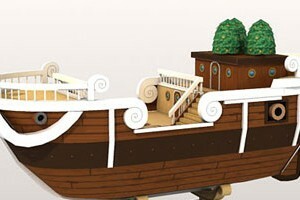 Going Merry part 2 paper model is ready for download. The ship is started to take shape, after this part will be the final part. This model is nothing to do with christmas, but I start to look like it is a christmas model by looking at the three orange trees, looks a lot like a christmas tree :). This model is delayed many times, I blame it to Call of Duty Modern Warfare 3 :p. Add me on Steam : Julescrafter. 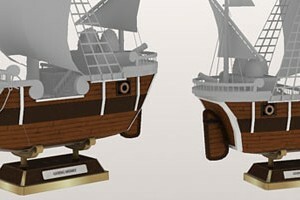 This model ship is a request from some of my fellow paper craft lovers. 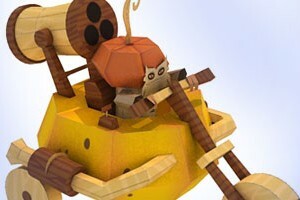 They said they want to see Paper Replika's version as there are already existing templates on this subject. 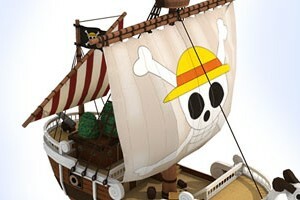 When I search about this Going Merry ship, I found one that caught my attention. It is a plastic model kit made by Bandai. It looks wonderful, and I thought I must make this into paper craft template. As usual I still can't figure out how much time needed to make this paper model, it's already 3 weeks since I start this project and it is not quite nearly a half done. 3 weeks are too long for only one project. So I took the same step as I did on Robocop ED-209, I have to split this Going Merry ship into 3 parts. The build model will be 40 cm or 15.7 inches in length.